Comm Eye Health Vol. 25 No. 78 2012 pp 39. Published online 09 October 2012. A 12-year-old boy fails his school vision screening test. His medical history is benign. Middle-aged relatives of both sexes for three generations reportedly have had central visual loss. His best-corrected visual acuities are 20/80 OD and 20/20 OS. 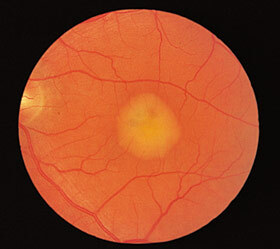 The disc, vessels, and retinal periphery of both eyes appear normal, but the macula of the right eye has a fibrotic scar and the left eye shows a yellow, round, circumscribed lesion of one disc diameter that blocks fluorescence on fluorescein angiogram. The ERG is normal, but the electro-oculogram ratio (light peak/dark trough) is reduced.